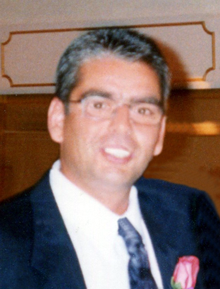 Fagone, Joseph A. of Revere former of East Boston, passed away peacefully surrounded by his loving family on April 5, 2018 at the age of 54. Loving son of the late Joseph and Gilda (Dipice) Fagone. Devoted father of Joseph Woodside, Mark and Christopher Dioguardi. Dear brother of John, Errol and Peter Fagone, Theresa Claybourne, Barbara Breault, Lorraine Brown, Ann Marie Sacco and Joseph “Jady” Fagone and the late Great Anthony Albano and Frankie Fagone. Also survived by many loving nieces and nephews. Family and friends will honor Joseph’s life by gathering at the Ruggiero Family Memorial Home 971 Saratoga St., East Boston on Monday April 9nd from 4:00 PM to 8:00 PM. and again on Tuesday morning at 8:30 AM before leaving in procession to Holly Redeemer Church at 65 London St, East Boston for a 10:00 AM funeral mass in celebration of Joseph's life. Cremation services to follow will be private.